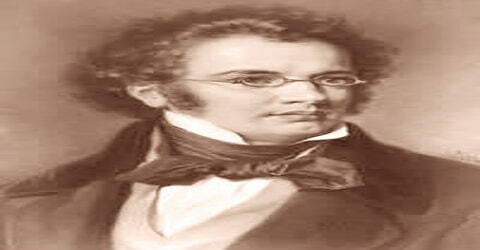 Franz Schubert – Austrian composer of the late Classical and early Romantic eras. 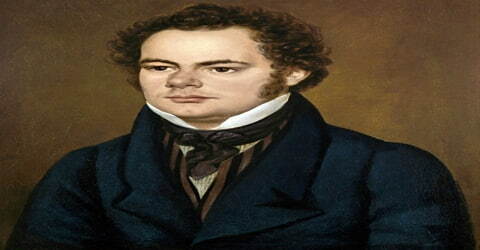 Franz Schubert, an early romantic Austrian composer, was born on January 31, 1797, in Alsergrund, Vienna, Austria. He is best known for his lieder (German art songs for voice and piano) during the nineteenth century. A new profusion of lyric poetry and the evolution of the piano into a highly complex mechanism allowed the gifted Schubert to compose exceptional lyrics. Born to immigrant parents in the Himmelpfortgrund suburb of Vienna, Schubert’s uncommon gifts for music were evident from an early age. His father gave him his first violin lessons and his older brother gave him piano lessons, but Schubert soon exceeded their abilities. Despite his short lifetime, Schubert left behind a vast oeuvre, including more than 600 secular vocal works (mainly Lieder), seven complete symphonies, sacred music, operas, incidental music and a large body of piano and chamber music. His major works include the Piano Quintet in A major, D. 667 (Trout Quintet), the Symphony No. 8 in B minor, D. 759 (Unfinished Symphony), the three last piano sonatas (D. 958–960), the opera Fierrabras (D. 796), the incidental music to the play Rosamunde (D. 797), and the song cycles Die schöne Müllerin (D. 795) and Winterreise (D. 911). His talent as a composer of classical and romantic compositions was mostly ignored while he was alive but became significant only in the 19th century. Though his life was very short, he was a prolific composer who used to create many compositions in one single day. His works were greatly influenced by the writings of Goethe and were based mainly on the piano. His sonatas on the piano used melodies that had long lines instead of the traditional short themes and the romantic songs or ‘Lieder’ in the German language written by him put greater importance on the piano than on any other instrument as an accompaniment. Appreciation of Schubert’s music, while he was alive, was limited to a relatively small circle of admirers in Vienna, but interest in his work increased significantly in the decades following his death. Felix Mendelssohn, Robert Schumann, Franz Liszt, Johannes Brahms, and other 19th-century composers discovered and championed his works. Today, Schubert is ranked among the greatest composers of the 19th century, and his music continues to be popular. Franz Schubert was not that well known in his early years as he was neither a literary person like many of the other composers during that period nor was a great performer or a famous conductor. But during the short time he was alive he wrote more than six hundred songs, nine symphonies, a large number of compositions for the piano and five masses. His masterpieces which brought enjoyment to many music lovers all over the world came to light only after he had passed away. Franz Schubert, in full Franz Peter Schubert, was born in Himmelpfortgrund (now a part of Alsergrund), Vienna, Archduchy of Austria on 31 January 1797, and baptized in the Catholic Church the following day. He was the twelfth child of Franz Theodor Florian Schubert (1763–1830) and Maria Elisabeth Katharina Vietz (1756–1812). His father Franz Theodor Schubert was a schoolmaster who founded his own school, and his mother Elizabeth Vietz was engaged in providing domestic services to a Viennese household before her marriage. Franz Schubert had three elder brothers named Ferdinand, Ignaz and Petrus and a sister named Maria Theresia. Out of the fourteen children that his father had (including an illegitimate child), nine had died in their infancy. He learnt to play the violin from his father and his elder brother Ignaz when he was only six years old and also learnt to play the organ from an organ player named Michael Holzerat the ‘Imperial Court Chapel’. His talent for performing vocal compositions was recognized by the leading authority in music in Vienna, Antonio Salieri, in 1804. In 1808, at the age of eleven, Schubert became a pupil at the Stadtkonvikt school, where he became acquainted with the orchestral music of Haydn, Mozart, and Beethoven. He left the Stadtkonvikt at the end of 1813, and returned home to live with his father, where he began studying to become a schoolteacher; despite this, he continued his studies in composition with Antonio Salieri and still composed prolifically. During his educational days, he was befriended by a 20-year-old law student named Joseph Spaun who formed an orchestra made up of his fellow students. 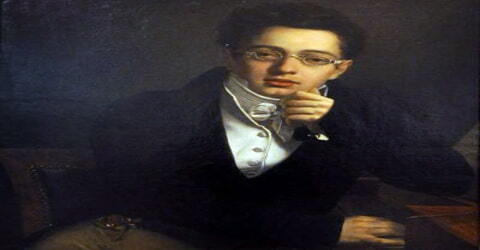 Schubert was a shy youth and spent most of his spare time practicing and composing by himself. He left the choir at age fifteen when his voice changed but continued to study at the seminary. Antonio Salieri, the emperor’s music director, heard about Schubert’s talents and took him in as a student. In 1808 he won a scholarship that earned him a place in the imperial court chapel choir and an education at the Stadtkonvikt, the principal boarding school for commoners in Vienna, where his tutors were Wenzel Ruzicka, the imperial court organist, and, later, the composer Antonio Salieri, then at the height of his fame. At the age of eleven, he joined the choir of the ‘Imperial Court Chapel’ after passing the entrance examination and received his formal education at ‘Stadtkonvikt’ from 1808 to 1813. He not only sang in the choir but also played the violin in the orchestra and was also an exceptional student. He left the choir, but not the seminary, at the age of fifteen when he could no longer sing as before due to a change in his voice. In 1821, Schubert was granted admission to the Gesellschaft der Musikfreunde as a performing member, which helped establish his name among the Viennese citizenry. He gave a concert of his own works to critical acclaim in March 1828, the only time he did so in his career. In 1814, Franz Peter Schubert fell in love with a soprano soloist named Therese Groband, daughter of a local silk manufacturer, wanted to marry her but could not because of the harsh marriage law which required proof that he earned enough to support a family. Schubert wrote several of his liturgical works (including a “Salve Regina” and a “Tantum Ergo”) for her; she was also a soloist in the premiere of his Mass No. 1 (D. 105) in September 1814. 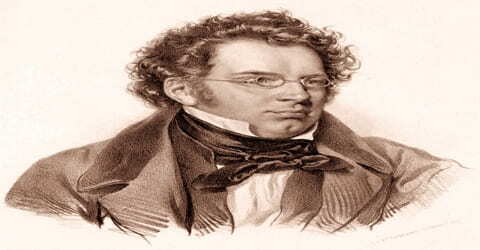 Franz Peter Schubert composed his earliest ballads while he was still in high school including ‘Hage’s Klage’ in 1811 styled on those written by Johann Rudolf Zumsteeg. The boy was occasionally permitted to lead the Stadtkonvikt’s orchestra, and Salieri decided to start training him privately in music theory and even in composition. It was the first orchestra he wrote for, and he devoted much of the rest of his time at the Stadtkonvikt to composing chamber music, several songs, piano pieces and, more ambitiously, liturgical choral works in the form of a “Salve Regina” (D 27), a “Kyrie” (D 31), in addition to the unfinished “Octet for Winds” (D 72, said to commemorate the 1812 death of his mother), the cantata Wer ist groß? for male voices and orchestra (D 110, for his father’s birthday in 1813), and his first symphony (D 82). In 1812 Schubert’s voice broke; he left the college but continued his studies privately with Salieri for at least another three years. During this time he entered a teachers’ training college in Vienna and in the autumn of 1814 became assistant in his father’s school. In the same year, the ‘Mass’ composed by him was performed in Vienna. Rejected for military service because of his short stature, he continued as a schoolmaster until 1818. In 1814 the genius of Schubert was first made evident in his work Gretchen am Spinnrade, inspired by his reading of Johann Wolfgang von Goethe’s (1749–1832) Faust. His first Mass and his first symphony appeared about this time and showed the influence of Haydn. Schubert set five other Goethe songs to music that year. By the end of 1814, Schubert was an assistant at his father’s school and had begun to make the acquaintance of numerous poets, lawyers, singers, and actors, who soon would be the principal performers of his works at private concerts in their homes or in those of their wealthier friends. One of Schubert’s most prolific years was 1815. He composed over 20,000 bars of music, more than half of which was for orchestra, including nine church works (despite being agnostic), a symphony, and about 140 Lieder. In that year, he was also introduced to Anselm Hüttenbrenner and Franz von Schober, who would become his lifelong friends. Another friend, Johann Mayrhofer, was introduced to him by Spaun in 1815. In 1814 he composed his first poem ‘Gretchen am Spinnrade’ or ‘Gretchen at the Spinning Wheel’ based on ‘Faust’ written by Johann Wolfgang von Goethe. He also composed the music of some solos of Mass which were dedicated to his lady friend Therese Grob. Haydn’s compositions had a great influence on his first symphony. During the same year, he also composed five more musical pieces based on songs written by Goethe. Other eighteenth-century lyric poets whose works Schubert set to music include J. G. von Herder, the collector, and translator of folk songs, F. G. Klopstock, and Friedrich von Schiller (1759–1805). None can compare, however, with the remarkable Goethe songs. Even the uninitiated (not educated on a particular subject) must respond to the excitement of the Erlkönig (1815), whereby means of changing accompaniment figures, sharp dissonance (an arrangement of clashing chords), and effective modulations (the shifting of one musical tone to another) Schubert makes a distinction between the four characters of the ballad narrator, father, son, and Erlking and creates one of the masterpieces of romantic music. Significant changes happened in 1816. Schober, a student and of good family and some means, invited Schubert to room with him at his mother’s house. The proposal was particularly opportune, for Schubert had just made the unsuccessful application for the post of kapellmeister at Laibach, and he had also decided not to resume teaching duties at his father’s school. By the end of the year, he became a guest in Schober’s lodgings. For a time, he attempted to increase the household resources by giving music lessons, but they were soon abandoned, and he devoted himself to the composition. “I compose every morning, and when one piece is done, I begin another.” During this year, he focused on orchestral and choral works, although he also continued to write Lieder. Much of this work was unpublished, but manuscripts and copies circulated among friends and admirers. Early in 1817, Schober brought the baritone Johann Michael Vogl to his home to meet Schubert. As a result of this meeting, Vogl’s singing of Schubert’s songs became the rage of the Viennese drawing rooms. His friendships with the Huttenbrenner brothers, Anselm, a composer, and Josef, an amateur musician, and with Josef von Gahy, a pianist with whom he played duets, date from these days. But this period of freedom did not last, and in the autumn of 1817, Schubert returned to his teaching duties. He wrote to his friends of himself as a verdorbener (“frustrated”) musician. The two earlier years had been particularly fruitful. Songs of this period include “Ganymed,” “Der Wanderer,” and the Harper’s Songs from Goethe’s novel Wilhelm Meisters Lehrjahre. There were two more symphonies: No. 4 in C Minor, which Schubert himself named the Tragic (1816), and the popular No. 5 in B-flat Major (1816). A fourth mass, in C major, was composed in 1816. Schubert also wrote a large number of compositions in 1815 which included more than one-hundred and forty-four songs, two ‘Masses’and one symphony. He set the music for the poems written by a large number of poets such as F.G. Klopstock, J.G. Von Herder, Friedrich von Schiller, and others. He went on composing symphonies even while working as a schoolteacher in his father’s school and wrote musical pieces for ‘Landler’, an Austrian waltz, for which he became quite famous. The year 1817 is notable for the beginning of his masterly series of piano sonatas. Six were composed at Schober’s home, the finest being No. 7 in E-flat Major and No. 11 in B Major. In early 1818, Schubert applied for membership in the prestigious Gesellschaft der Musikfreunde, intending to gain admission as an accompanist, but also so that his music, especially the songs, could be performed in the evening concerts. He was rejected on the basis that he was “no amateur”, although he had been employed as a schoolteacher at the time and there were professional musicians already among the society’s membership. However, he began to gain more notice in the press, and the first public performance of secular work, an overture performed in February 1818, received praise from the press in Vienna and abroad. Schubert’s years of uncongenial schoolmastering ended in the summer of 1818. His frustrated period in the spring had produced only one substantial work, the Symphony No. 6 in C Major. In the meantime his reputation was growing, however, and the first public performance of one of his works, the Italian Overture in C Major, took place on March 1, 1818, in Vienna. In June he left the city to take up the post of music master to the two daughters of Johann, Count Esterházy, in the family’s summer residence at Zseliz, Hungary. Letters to his friends show him in exuberant spirits, and the summer months were marked by a fresh creative outburst. The piano duets Variations on a French Song in E minor and the Sonata in B-flat Major, sets of dances, songs, and the Deutsche Trauermesse (German Requiem) were completed. He wrote his famous quintet for the piano while holidaying in upper Austria which was soon followed by other compositions such as ‘Wanderer Fantasy’, ‘Oratorio Lazarus’ and others. In 1820, Schubert wrote the operetta ‘Die Zwillingsbruder’ or ‘The Twin Brothers’ which was successfully performed in the month of June in the same year. He also composed the music for the play ‘Die Zauberharfe’ or ‘The Magic Harp’ which was performed on August 1820. Schubert and four of his friends were arrested by the Austrian police, who (in the aftermath of the French Revolution and Napoleonic Wars) were on their guard against revolutionary activities and suspicious of any gathering of youth or students. One of Schubert’s friends, Johann Senn, was put on trial, imprisoned for over a year, and then permanently forbidden to enter Vienna. The other four, including Schubert, were “severely reprimanded”, in part for “inveighing against officials with insulting and opprobrious language”. While Schubert never saw Senn again, he did set some of his poems, Selige Welt (D. 743) and Schwanengesang (D. 744), to music. The incident may have played a role in a falling-out with Mayrhofer, with whom he was living at the time. In September 1821 Schubert and Schober left Vienna for the country with the intention of writing Alfonso und Estrella, his only grand opera. Shortly after his return to the city, he met Edward Bauernfeld, who introduced him to William Shakespeare’s (1564–1616) works. In the fall of 1822, having completed his Mass in A-flat, Schubert began work on the Symphony in B Minor, which became known as the Unfinished. Three movements were sketched; two were completed. It is not known why the work was left incomplete. All of Schubert’s efforts to publish his own work were fruitless. Early in 1821, however, a few friends offered his song “Erlkönig” (“Erl King” or “Elf King”) on a subscription basis. The response was so successful that enough money was raised for the printing of “Gretchen am Spinnrade” also. Eighteen months later, opus 12 had been reached. In 1822 he started on his eighth symphony but could complete only two movements as he had fallen ill by that time. By the end of this year, he was in financial doldrums and his friends left him. During the seven days that he spent at the ‘Vienna General Hospital’, Franz Peter Schubert was somehow able to start composing a few of his famous songs which included ‘Die Schone Mullerin’ or ‘The Fair Maid of the Mill’ and also an octet for string and woodwind instruments. The compositions of 1819 and 1820 show a marked advance in the development and maturity of style. The unfinished oratorio Lazarus (D. 689) was begun in February; later followed, amid a number of smaller works, by the hymn “Der 23. Psalm” (D. 706), the octet “Gesang der Geister über den Wassern” (D. 714), the Quartettsatz in C minor (D. 703), and the Wanderer Fantasy in C major for piano (D. 760). In 1820, two of Schubert’s operas were staged: Die Zwillingsbrüder (D. 647) appeared at the Theater am Kärntnertor on 14 June, and Die Zauberharfe (D. 644) appeared at the Theater an der Wien on 21 August. He worked during August 1821 on the seventh symphony in E Minor and Major, but this, too, was put aside, along with many other unfinished works of the period. His determination to establish himself in opera led him in September and October to spend a short holiday with Schober at Sankt Pölten, where the friends devoted their energies to the production of a three-act opera, Alfonso und Estrell. It was completed in February 1822 but was never performed. While spending a few days at Atzenbrugg in July 1822, with Schober and other friends, he produced the document called Mein Traum (“My Dream”), describing a quarrel between a music-loving youth and his father. The production of the two operas turned Schubert’s attention more firmly than ever in the direction of the stage, where, for a variety of reasons, he was almost completely unsuccessful. In 1822, Alfonso und Estrella was refused, partly owing to its libretto (written by Schubert’s friend Franz von Schober). In 1823, Fierrabras (D 796) was rejected: Domenico Barbaia, impresario for the court theatres, largely lost interest in new German opera due to the popularity of Rossini and the Italian operatic style, and the failure of Carl Maria von Weber’s Euryanthe. Die Verschworenen (The Conspirators, D 787) was prohibited by the censor (apparently on the grounds of its title), and Rosamunde, Fürstin von Zypern (D 797) was withdrawn after two nights, owing to the poor quality of the play for which Schubert had written incidental music. The autumn of 1822 saw the beginning of yet another unfinished composition not, this time, destined to obscurity: the Symphony in B Minor (Unfinished), which speaks from Schubert’s heart. Two movements and a half-finished scherzo were completed in October and November 1822. In November of the same year, Schubert composed a piano fantasia in which the variations are on a theme from his song “Der Wanderer” and completed the Mass in A-flat Major. Schubert’s health began to fail, and in May he spent time in the Vienna General Hospital. Rosamunde, a play for which Schubert had written incidental music only the overture and ballet music is heard today failed in 1823 and brought to a close his extended efforts to achieve a successful opera. Schubert now turned to chamber music, producing an Octet for woodwinds and strings and his A Minor, D Minor, and G Major Quartets. In 1825 Schubert formed the mainstay of the Schubertiads, evenings at which Schubert’s songs were sung. In February 1823, Schubert wrote the Piano Sonata in A Minor, and in April he made another attempt to gain success in Viennese theatres with the one-act operetta Die Verschworenen (The Conspirators), the title being changed later (because of political censorship) to Der häusliche Krieg (Domestic Warfare). The famous work of the year, however, was the song cycle Die schöne Müllerin (“The Fair Maid of the Mill”), representing the epitome of Schubert’s lyrical art. Schubert spent part of the summer in the hospital and probably started work while still a patient on his most ambitious opera, Fierrabras. The work was rejected by the Directorate of the prestigious Kärntnertor Theatre in Vienna. The year 1823 closed with Schubert’s composition of the music for the play Rosamunde, performed at Vienna in December. 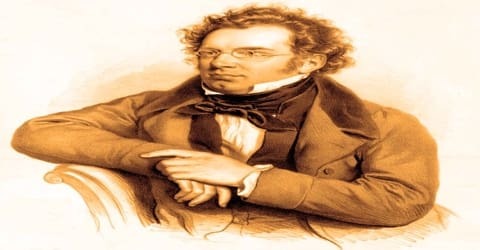 During the period 1826-27, Franz Peter Schubert saw the recurrence of his illness but also composed two of his greatest masterpieces despite his deteriorating health. He acted as a torchbearer during the funeral of Beethoven in 1827 and wrote his greatest masterpiece during this time. He completed the two series of ‘Impromptus’ for the piano at the end of 1827. In 1826, Franz Schubert dedicated a symphony (D. 944, that later came to be known as the Great C major) to the Gesellschaft der Musikfreunde and received an honorarium in return. The String Quartet No. 14 in D minor (D. 810), with the variations on Death and the Maiden, was written during the winter of 1825–1826, and first played on 25 January 1826. Later in the year came the String Quartet No. 15 in G major, (D 887, first published as op. 161), the Rondo in B minor for violin and piano (D. 895), Rondeau brilliant, and the Piano Sonata in G major, (D 894, first published as Fantasie in G, op. 78). He also produced in 1826 three Shakespearian songs, of which “Ständchen” (D. 889) and “An Sylvia” (D. 891) were allegedly written on the same day, the former at a tavern where he broke his afternoon’s walk, the latter on his return to his lodging in the evening. In 1826 and 1827, despite the reappearance of his illness, Schubert wrote four masterpieces, each of which has remained a staple in his repertory (works commonly performed): the String Quartet in G, the Piano Sonata in G, the Piano Trio in B-flat, and the second Piano Trio in E-flat. Schubert was one of the torchbearers at Beethoven’s funeral in 1827. Toward the end of that year, Schubert completed his two series of piano pieces that he himself entitled Impromptus. In 1827, Schubert wrote the song cycle Winterreise (D. 911), the Fantasy in C major for violin and piano (D. 934, first published as op. post. 159), the Impromptus for piano, and the two piano trios (the first in B-flat major (D. 898), and the second in E-flat major, (D. 929); in 1828 the cantata Mirjams Siegesgesang (Victory Song of Miriam, D 942) on a text by Franz Grillparzer, the Mass in E-flat major (D. 950), the Tantum Ergo (D. 962) in the same key, the String Quintet in C major (D. 956), the second “Benedictus” to the Mass in C major (D. 961), the three final piano sonatas (D. 958, D. 959, and D. 960), and the collection 13 Lieder nach Gedichten von Rellstab und Heine for voice and piano, also known as Schwanengesang (Swan-song, D. 957). In 1827, Schubert wrote his greatest masterpiece ‘Die Winterreise’ or ‘A Winter’s Journey’ which was based on a set of twenty-four poems written by Wilhelm Muller describing the journey of a young man suffering from his lover’s rejection through the wasteland in winter. 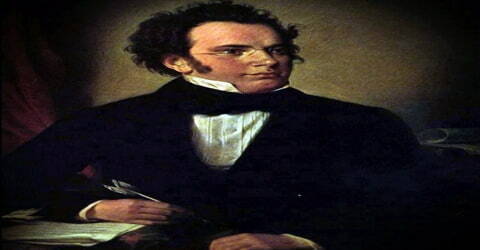 In 1828 Schubert composed several first-rate works: the magnificent F-Minor Fantasy for piano duet, the C-Major Symphony, the Eflat Mass, and nine songs to Ludwig Rellstab’s poems. On March 26, 1828, Schubert participated in the only full-scale public concert devoted solely to his own works. In 1872, a memorial in his honor was constructed at the Stadtpark in Vienna. Franz Peter Schubert contracted syphilis in May 1822 and was admitted for treatment to the ‘Vienna General Hospital’and was discharged after seven days. His illness reappeared in 1826 and on November 11, 1828, he started having headache and nausea which were diagnosed to be caused by typhoid. He died in Vienna, aged 31, on 19 November 1828, at the apartment of his brother Ferdinand. The cause of his death was officially diagnosed as typhoid fever, though other theories have been proposed, including the tertiary stage of syphilis. 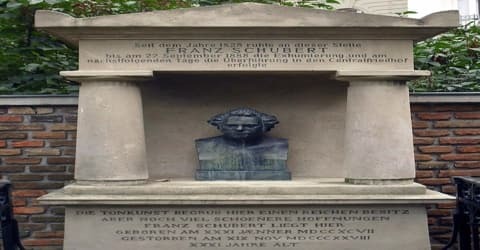 It was near Beethoven, whom he had admired all his life, that Schubert was buried by his own request, in the village cemetery of Währing, Vienna. He had served as a torchbearer at Beethoven’s funeral a year before his own death. In 1830, money was raised through a fund to place a memorial stone over his grave. In 1888, his grave was moved to Zentralfriedhof, which is the largest cemetery in Vienna and was placed beside musical geniuses like Johannes Brahms and Johann Strauss II. The cemetery in Währing was converted into a park in 1925, called the Schubert Park, and his former gravesite was marked by a bust. His epitaph, written by his friend, the poet Franz Grillparzer, reads: Die Tonkunst begrub hier einen reichen Besitz, aber noch viel schönere Hoffnungen (“The art of music has here interred a precious treasure, but yet far fairer hopes”). In musical history Schubert stands with others at the beginning of the romantic movement, anticipating the highly personal approach to the composition of later composers but lacking the forcefulness and the creative means to experiment with instrumental music that Beethoven displayed. He had written numerous compositions which include sonatas for the piano, waltzes, trios, quartets, and quintets for the piano, chamber sonatas, and symphonies. Many of Schubert’s large-scale instrumental pieces were unknown until after the middle of the nineteenth century. Moreover, unlike many other romantic composers, Schubert did not try a literary career. He was never a conductor or virtuoso (extremely gifted and skillful) performer. He did not achieve considerable public recognition during his lifetime.